Recently I received an email from Dwayne Bungay, introducing his new website Australian Designer and inviting me to join... after looking around it didn't take me long to jump on board and be part of this site that promotes Australian Designers! Australian Designer is 'a community of designers who create stunning works of functional homeware for your home.' 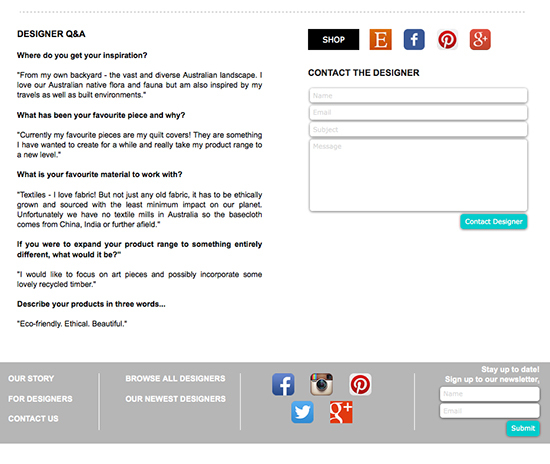 The idea behind the site is to encourage Australians to buy Australian-made and to support our creative communities. Here is the Pinch River profile (all one page on the site but I had to make 2 screen shots) and as you can see this is not a market place, instead it operates as a directory, in a way that directs traffic to your site and all your social media. 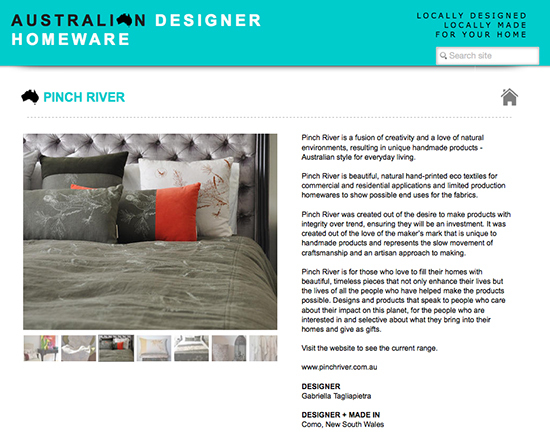 Currently Pinch River can be found in Living Room, Kitchen + Dining, Storage and Bedroom as well as being featured under 'Our Newest Designers' for the month of May. I think Dwayne has done a great job and I'm all for supporting our creative industries in this way and keeping in Australia! If your homeware products are designed and produced in Australia and you are interested in getting on board then check out the For Designers page and send an enquiry via the site.